Social media companies have been gushing about approaching their “mobile moment” — when mobile will overtake the desktop as the form of interaction — and 2014 may be the perfect time to strike. Whether it’s LinkedIn announcing an aggressive mobile strategy to capitalize on emerging markets or Facebook thinly concealing its excitement for its new mobile ad network, social media companies have mobile on the brain, and for good reason. A new report from Quantcast released Thursday morning, compiled with Quantcast data along with the research from various firms, shows that mobile is not only taking off for social media apps, it has made social platforms a driver in discovery of web content. According to the report, up to 25 percent of mobile web browsing comes from in-app browsing, and social apps — which make up eight of the top ten apps in the world — provide the bulk of that traffic. Social apps, as a category, also have the highest usage rate among U.S. users: 63 percent of Facebook (s fb) users, 57 percent of Instagram users and 46 percent of Twitter (s twtr) users are on mobile daily. The overall percentage of social visitors using mobile devices globally has also seen a significant jump: 77 percent of Facebook users, 76 percent of Twitter users and 75 percent of Pinterest users are on mobile. That’s a significant jump from just a year prior, which saw 64 percent of Facebook users, 60 percent of Twitter users and 56 percent of Pinterest users on mobile. No surprise that the high usage rate means social networks are gaining tons of mobile referrals — according to the report, social media mobile referrals perform double that of desktop versions. As reported previously, Facebook makes up the bulk of those referrals, but Twitter’s mobile referrals outpace its desktop referrals by five to one. 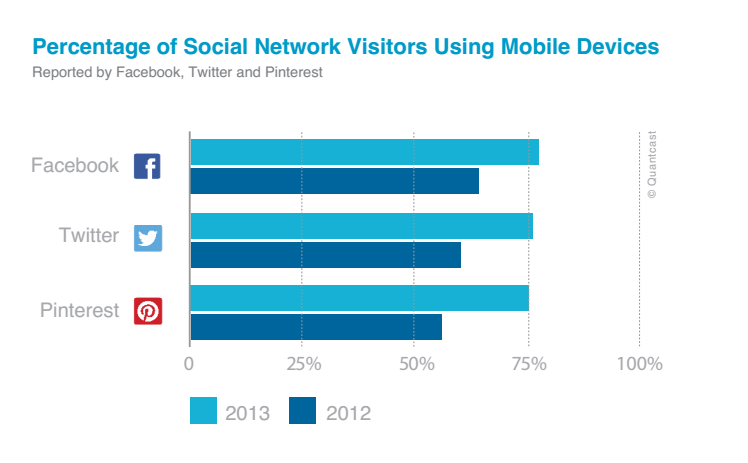 Mobile is the next and strongest frontier for social companies — now it’s up to them to turn that into revenue.